455 in stock Need More ? With Sophie still missing in action after their explosive mission in Paris, Lil decides to take matters into her own hands. 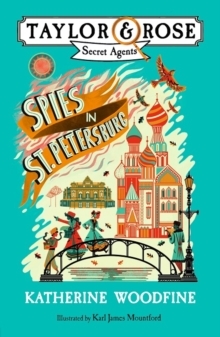 On a new mission for the Secret Service Bureau, can Lil find Sophie in misty, mysterious St Petersburg?Can they uncover the identity of their true enemy and can they trust anyone - even the Bureau? It's time for Sophie and Lil to put their spy skills to the test. Read the first book in the TAYLOR AND ROSE SECRET AGENTS series: PERIL IN PARISDon't miss The SINCLAIR'S MYSTERIES series:THE CLOCKWORK SPARROWTHE JEWELLED MOTHTHE PAINTED DRAGONTHE MIDNIGHT PEACOCKPerfect for fans of Robin Stevens' Murder Most Unladylike series, Katherine Rundell and Emma Carroll.